Ever since I got a data plan, I've been glued to my phone because of all the new stuff I can now do on my phone with the Internet! This used to drive my boyfriend totally nuts because I am perpetually reading Twitter updates, checking my email or talking to my friends on MSN. Most importantly to me were the UNLIMITED SMSES and the free incoming calls. The student plans also offer free calls on campus (e.g. 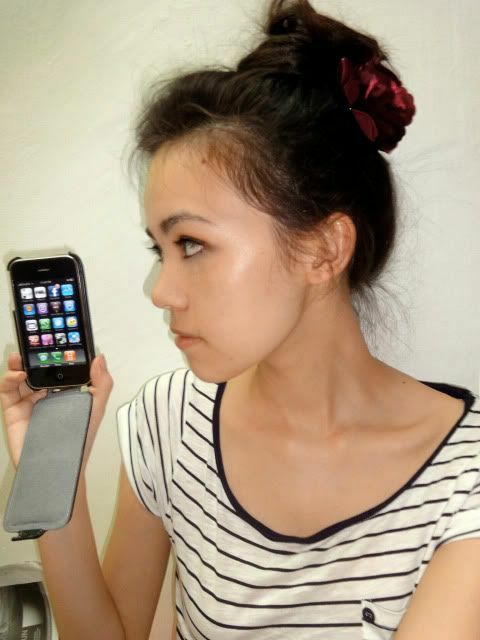 NUS for me) and camps, as well as a data bundle for surfing the Internet on your phone! With the data plans I can use my phone for Internet-related apps like Facebook & Twitter as well as surf the net, all without worrying about chalking up a HUGEEEE phone bill. My Twitter! 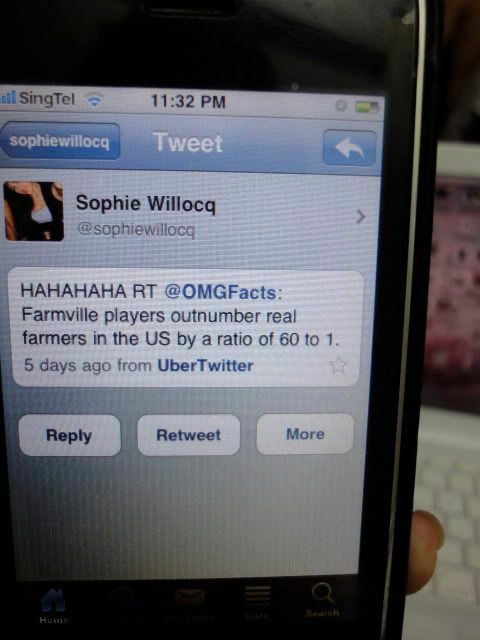 Haha every day I wake up and read Twitter updates from my friends in the night. 1) 12GB of data- is honestly a lot, so I will not need to worry about overshooting my data usage :D Even if I do end up overshooting (because I'm glued to my phone/Internet like that), SingTel has in place a $30/month cap for unlimited data usage- so no matter what you do you know it won't exceed $30. This would totally give tons of people a peace of mind and is available for both iFlexi & 3G Flexi plans! 2) Free AMPed- AMPed is SingTel's music store, and from here you'll get unlimited music downloads with no data charges! (this means the data usage from song downloading is not counted in your 12GB) The songs can be easily synced to your phone and computer, so bye-bye having to pay for songs $_$ or slow transfers from friends (mine never have the songs I want). You can even get to view exclusive music videos from the AMPed portal which this feature is available for both iFlexi & 3G Flexi plans as well! 3) Free MobileTV- now I can watch the news/my fav sitcoms/football (I don't, but a lot of my guy friends do and this means we all used to have to cluster at the TVs at Zouk when for example Liverpool vs. Manchester United was on) (ugh) on my phone, anywhere I want. Do note that this feature is available for iFlexi plans only (for iPhones). Lots of my friends now have phones with data plans, be it iPhones and Nokias, etc. This means that we're perpetually connected to each other and it's so much easier and more fun to talk cause I can leave them a comment on Facebook, tweet about them, upload a picture of us or even just email them cause they'll receive all of this stuff immediately on their phones! Seriously can't imagine my life now without a phone that can surf the Internet! I mean for me I even blog using my phone sometimes, and receive all notifications of new blog comments on my phone through my Gmail. It's really useful for school too cause I can read emails from my groupmates and reply them on-the-go, and even view/download the documents! Just the other day we were at Dempsey and all of us had our phones out doing our usual nonsense, till someone said "Hahaha okay seriously everyone, phones away!!" Some mandatory camwhoring. Haha you can see in the photos that there's a Facebook notification. So now you can have 2-in-1 plans (iFlexi or 3G Flexi, depending on your phone) featuring both your normal voice and SMS benefits, as well as data usage for the Internet and related apps! 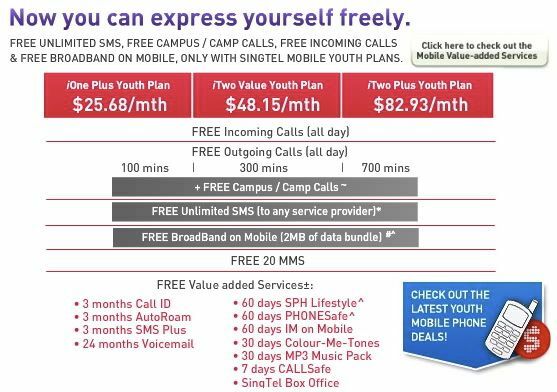 Now you can Express Yourself Freely with SingTel Mobile Youth Plans. 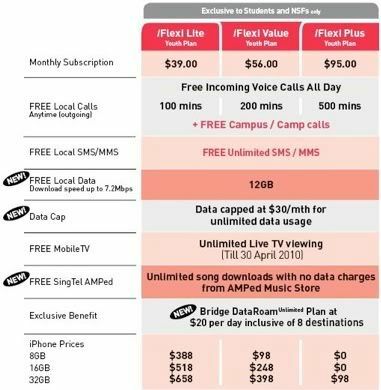 Visit any SingTel shop or www.singtel.com/youth for more details. u so saved this entry in your drafts. lol what's with the hair do? 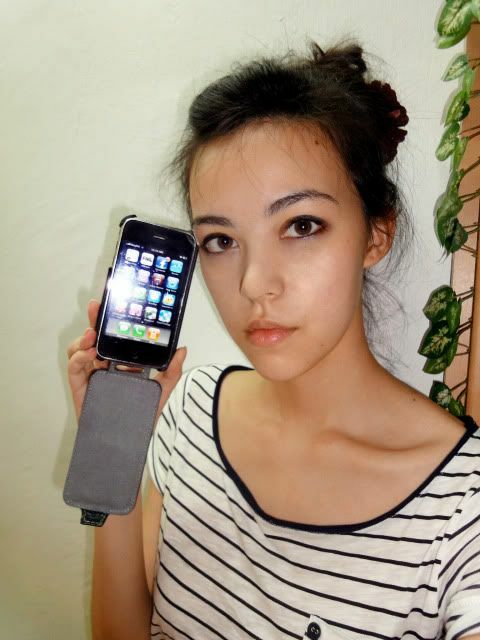 and i thought u use bb not iphone? I want to get a iphone 6s plan im a student so how?